Honda EM10000 is an 8KVA gasoline generator with key start (Electric Starter) for homes and small businesses. The key start makes it very convenient to use and with a noise level of 73dB(A) at a distance of 7m, it is one of the most silent generators you will find with equivalent power output. Honda EM10000 generator is powered by Honda’s GX620 – 2-cylinder, 4-stroke, OHV engine. It has a rated power output of 8KVA (8000VA), but can supply a maximum 9000VA for 10 seconds (useful when starting devices). The generator can handle a continuous operation time of about 6 hours 30 minutes with an average fuel consumption of 4.77 litres per hour. The fuel tank can hold 31 litres of gasoline. Unleaded gasoline with Octane 86 or higher is recommended for the generator. The oil crankcase measures around 1.1 litres, so you will need to buy an oil can larger than the 1 litre standard containers. The oil alert system will alert you when oil is down, but it is always a good idea to check oil level every few days or before each start. Honda EM10000 generator delivers stable 220V with a built-in Automatic Voltage Regulator (AVR). It measures 973 x 552 x 637 mm and weighs 150kg (dry weight). If you are looking for a top grade generator to power your home or small business, the Honda EM10000 generator is a great option. Its low noise operation and easy start features makes it a great buy. It also comes with enough output to power appliances like air conditioner and deep freezers. 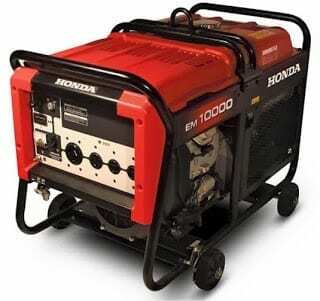 Honda EM10000 generator price in Nigeria is around 1,255,000 Naira. 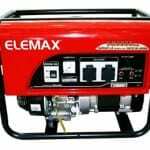 You can buy the generator at leading online stores in Nigeria as well as retailers of Honda and Power solutions.